Pretty much. The biggest selling point of this bottle is the filter. The filter is a “closed” compartment in the bottle, which means that water can get in and out, but the grounds can not. Filtering the grounds out of the water with a French Press and V60, like I described in Cold Brew Coffee, can be a tedious and slow process. The Filter-in Coffee Bottle enables you to just lift the grounds out. Optionally add milk or water and enjoy! The Filter-in Coffee Bottle has solved a problem that I have run into several times with immersion Cold Brew, filtering. The filter is very well built, locks tightly and has a very fine plastic mesh that doesn’t add or subtract from the taste of the coffee. However, the mesh doesn’t have the fine trapping characteristics of a paper filter, if your grinder produces a lot of fine dust you will find that in the bottom of the bottle. All normal grounds will come out very easily when you lift the filter out, making a half hour task last no longer than 5 seconds. Hario makes this bottle in two colors, the mocha colored one they sent me, and a brown version. The top of the bottle is rather flexible, which makes it easy to put it on the bottle or take it off. 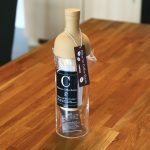 Even though it has plenty of grip on the glass lower half, it isn’t recommended to carry the bottle by the top as it will undoubtedly detach itself. On the side of the bottle there are a few marks indicating specific volumes, including one at the 700 ml level. On the subject of volume, I would’ve liked to see an alternative, bigger bottle. The brewing vessel is also the serving and storing vessel, making it is impossible to brew the next batch while there’s still coffee in the bottle. There’s only one thing I didn’t like, which was the recipe that came with it. An 8 hour brewing time is a very short time for cold brew coffee. Putting the bottle in the fridge while brewing slows down the extraction even further, making that 8 hour window too short. I’ve successfully left it on the counter for 36 hours which resulted in a more concentrated, fuller bodied coffee. Hario has made a very nice looking version of their Mizudashi brewers in the shape of a wine bottle. The filter works great and cleanup is easy, just empty the filter and put everything in the dishwasher. It doesn’t have any real downsides, the recipe in the end is entirely up to you.